Scientists have been finding evidence of life inside meteorites for well over 100 years  that, or the building blocks of life. The claims of life have been debunked every time, most recently just this past March. It always turns out to be a wishful interpretation of chemicals, minerals and tiny structures inside the meteorite that could be the fossilized husks of long-dead bacteria  but almost certainly aren't. The building blocks, though, have proved a lot more convincing. As far back as the 1960s, it was clear that amino acids, which link up to form proteins, can and do form in space. And now scientists at NASA's Goddard Space Flight Center in Greenbelt, Md., are claiming that another set of molecules crucial to life have also rained down on Earth: adenine and guanine, two of the four so-called nucleobases that, along with cytosine and thymine, form the rungs of DNA's ladder-like structure. By itself, that wouldn't mean much, says Michael Callahan, lead author of a new paper in Proceedings of the National Academy of Sciences. "People have been finding nucleobases in meteorites since the late 1960s," he says. But they've always been among the handful of nucleobases common to organisms on Earth, so contamination on the ground after the meteorite landed has been the most likely explanation. "When I picked up on this research," says Callahan, a chemist with Goddard's Astrobiology Analytical Laboratory, "I was convinced that it was all contamination." But once he and his collaborators got hold of samples from 12 meteorites that had landed mostly in Antarctica and ran them through the lab's liquid chromatograph and mass spectrometer, they discovered all sorts of other molecules  substances that were similar in structure but not biologically useful. 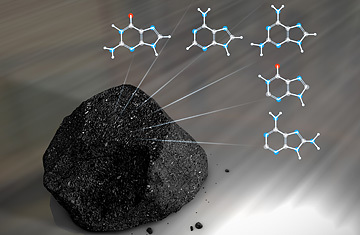 That was a surprise; if a meteorite picked up its biological traces on the ground, the adenine and guanine would have been accompanied by other, equally familiar molecules  not these substances that were not quite nucleobases but not quite not either. "That," says Callahan, "argues against the idea that someone sneezed on the meteorites." Another argument against earthly contamination is that when the scientists took samples of ice and soil from the sites where the meteorites were found, they saw the usual terrestrial mix of organic molecules but not their nonbiological cousins. If the molecules came from the landing sites rather than from space, you'd expect to see the nonbiological cousins as well. A third line of evidence comes from the fact that life-related substances are common in space. Hydrogen cyanide, ammonia and water  critical to building biology  are known to exist throughout the cosmos, and when you mix them together in a lab, says Callahan, "it's pretty easy to make nucleobases." It's not even a little bit of a stretch to imagine that the same processes could happen on, or in, a meteorite. It's also at least plausible that life would never have arisen on our planet without a liberal dose of space chemicals, delivered to Earth on a barrage of meteorites billions of years ago. The new research doesn't address the question of panspermia, the not entirely crazy idea that life arrived on our planet fully formed as viruses or bacteria that developed on another world. If that turns out to be the case  if we find microbes on Mars or on a meteorite, for example, with DNA identical to ours  we might face the disturbing fact that we're the contamination on a formerly pristine planet. What the new research does is reinforce an idea that astronomers and biologists  and, increasingly, the people who call themselves astrobiologists  find very convincing: since the raw materials of life are common in the universe, and since we now know that planets are common as well, it's hard to imagine how the Milky Way could not be teeming with life. Our species may continue to be special in a lot of ways  but perhaps a little less so than we thought. See images from space by an astronaut photographer. See the top 10 strange objects sent into space.